I'm the kind of person that has theories - about most things. Some of them are awesome. Some of them are totally crazy. Often though that isn't apparent which is which. So I have this theory about the middle of a project. I'll let you decide which camp it falls in. For me the half-way of the project is the part I struggle with. I often get completely stuck. It is the bit where the thing you are making isn't formed enough for you to see whether it has worked, and yet you have already put in so much work in, that the idea that it might not have worked can be demoralising. And make you not want to keep doing it. Or maybe just throw it pins and all into the bin (which I am happy to admit I have done). So how to move on. I thought I would write a list (who doesn't love a list!) of things to do when you are stuck in the middle. 1. Get a friend to push you in either direction. Mine do this admirably! The quilt top below has been relegated and it is all thanks to them. I knew it was a bit wrong but just couldn't get my head around the fact I was really bad without their loving help. They mocked me quite a bit. By the way, it is a lot worse than the picture suggests. This is the perfect example of when a friend (or 3) can help. Every single one of my mates who saw this went "aahhh yeah. I'm really not sure....". It now resides - perhaps permanently - in a drawer. 2. Put it in a drawer and walk away for .... X months. At the moment I'm not sure I will ever pick the grey jumper up again. I might. I might not. The colourwork cardy at the top of the post however only needed a 2 week stay for me to regain my enthusiasm. 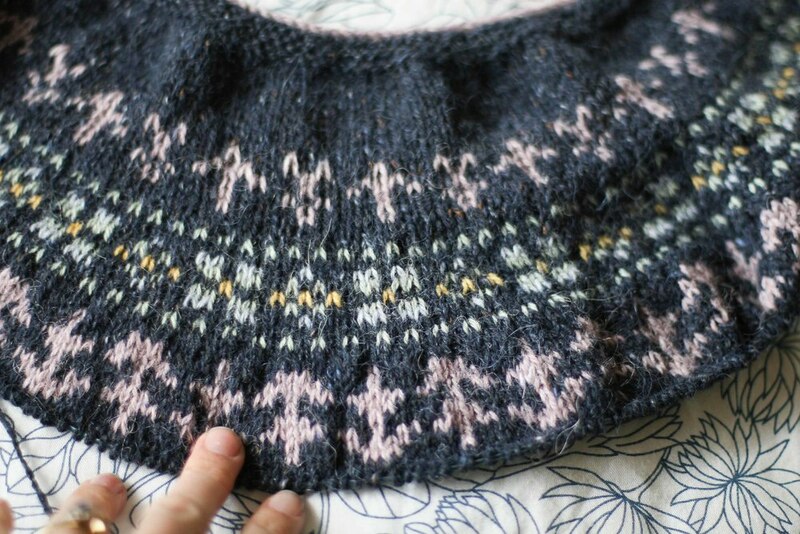 A jumper knitted in 5ply up to the underarms. I have also knitted both sleeves. It has sat in the drawer now for a year. 3. Take a deep breath and keep going. Trust. Trust - so you need to trust in the original idea. You need to trust your skills and ability. You need to trust that even if the outcome totally bombs then you will have learned enough lessons that the wasted time and materials add up to something useful. Trust that the finished thing - even though it may not be perfect is good enough! Beautiful in it's own right. Embrace the wabi-sabi? Here I am choosing to trust. I am not getting stuck on every little decision even though I sooo want it to be perfect. My lovely friend Anna has this friend Gina who says* that sometimes the piece you are working on is the piece you need to make, so that you can make the piece you really want to make. Or sometimes you need to make bad art to make good art. I've been feeling that way a lot over the last year or so, as I have been learning a newish craft to me - quilting. Knitting I already know. When I have an idea - I can pick up my needles and knit it. This is not happening in quilting. In quilting the ideas that are in my head are not what is coming out of my sewing machine. I guess this post is a good reminder to me not to give up. There is meaning in the things I am making. They are taking me to a place where I can make the things I want to make. Mastering the craft so to speak. Does anyone else ever have this issue? What do you do to get past the middle? Is trust the way forward? * Completely paraphrasing her second hand advice! Big hi! to the lovely instagrammers who weighed in on this one. Their suggestions were also to give it to someone else who may love it and also to add "more colour".